In case you need a reminder, Mother’s Day is this Sunday. And I have got a recipe, THE recipe, for all dads and partners out there, a recipe that the whole family will eat. Three easy steps and you can have breakfast ready for mom. 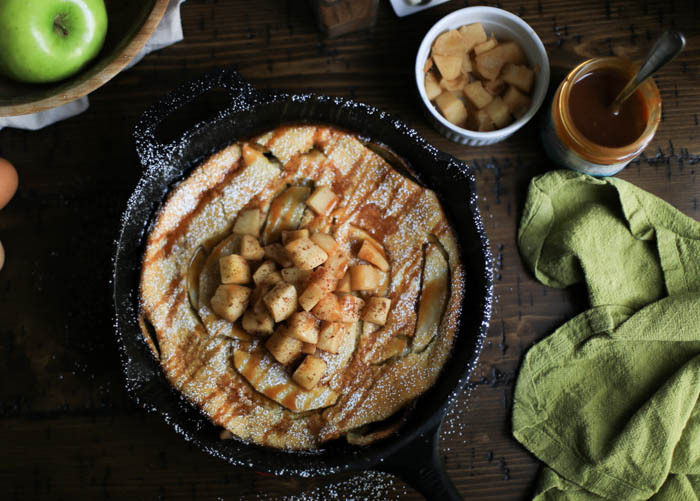 It’s one, big, fluffy apple cinnamon pancake topped with caramel and sugar. You could earn endless brownie points here. 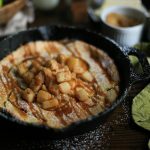 This baked apple pancake is also known as a German pancake (straight from the motherland), or more popular: Dutch baby. So you can make a Dutch baby for Mother’s Day! I know, I know. The puns, the possibilities. I am so proud of myself for this one. In full disclosure I had never made this recipe before – this was the first time I attempted it, and was impressed by its simplicity. I had seen Dutch baby recipes on Pinterest and such, and assumed the baked pancakes were difficult. Oh, not so, my friend. The recipe takes about 10 minutes of prep and 30 minutes in the oven. Dutch baby in the oven! Sorry. 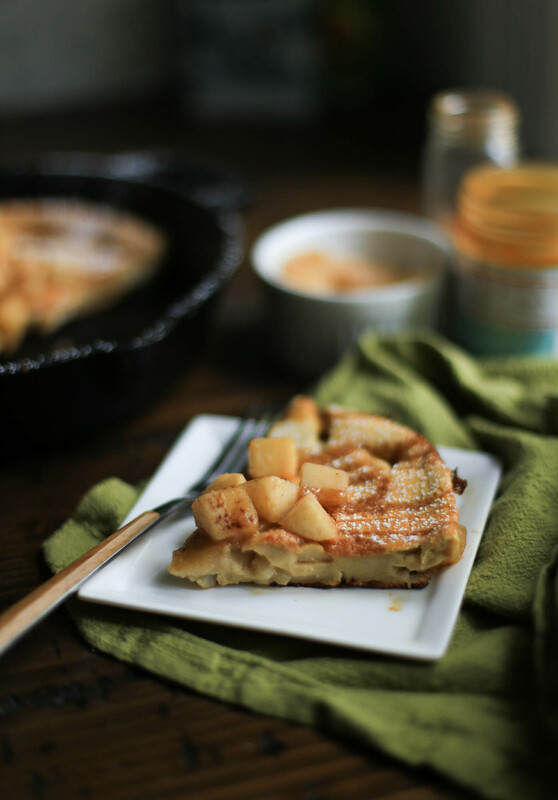 While the baked apple pancake is in the oven you can make an apple topping (or not, up to you! ), pour some coffee, and get the kids to the table. Or prepare a breakfast tray for breakfast in bed, if you’re looking for the BIG brownie points. This recipe, I tell ya. It’s even less effort than regular pancakes! No standing over the stove or flipping required. Whip the ingredients in a blender, transfer them to a heated skillet, and bake. Seriously, that’s it, which means only two pans for clean-up too. Hey, if it’s for Mother’s Day, you got all the duties, chef. 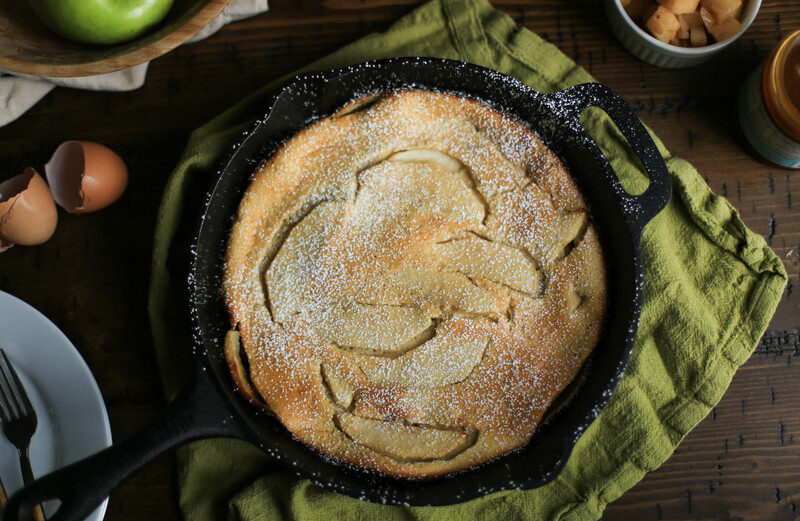 So, if you can measure ingredients, you can make this baked apple pancake. And even make it look like a super pretty Dutch baby. Read on for tips. don’t forget some maple syrup on the side; it is a pancake after all….but maybe just go straight for the ice cream? Next time I make a Dutch baby (HA, the joke doesn’t get old) I want to try a savory version! As a fan of both sweet and savory breakfasts, I am intrigued by the possibility of trying salmon/dill/cream cheese, or classic ham and cheese. 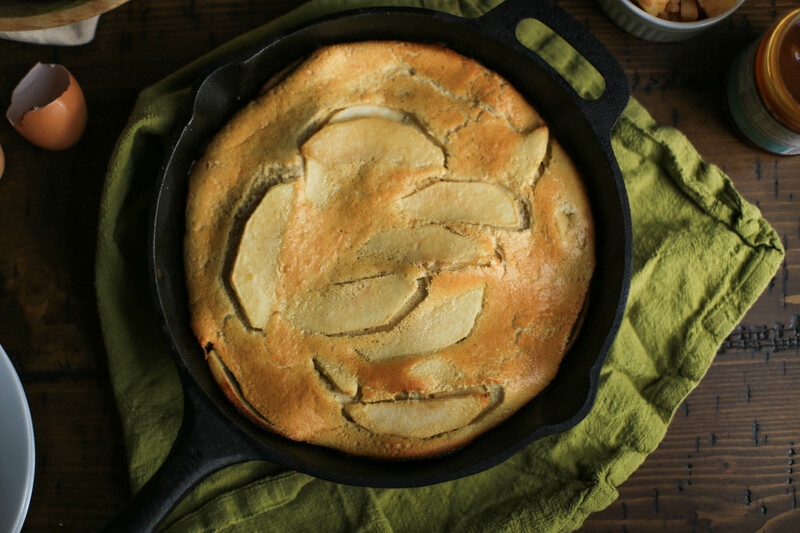 A baked apple pancake is a simple weekend breakfast that both kids and adults will love. Almost like a cross between a crepe and a popover, this one-skillet pancake is puffy, light, and fantastic. Preheat the oven to 425 degrees F. Place the eggs, milk, flour, sugar, vanilla, salt, cinnamon, and nutmeg in a blender. 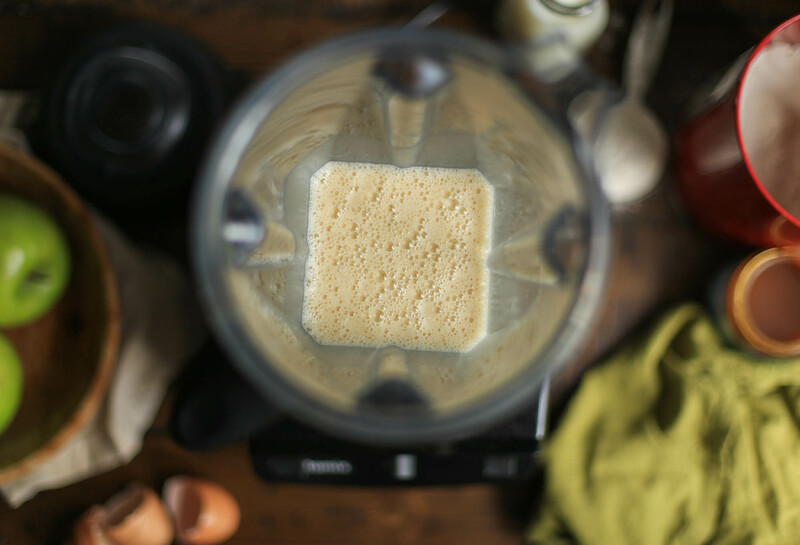 Blend until smooth - the batter will be thin and creamy. Set aside. Peel and thinly slice the apple. Heat a 10-inch oven-safe skillet over medium heat. 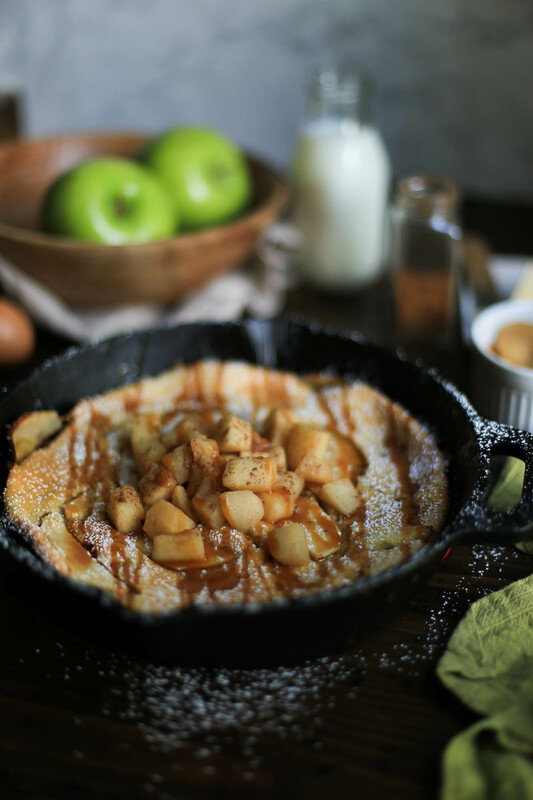 Melt the butter in the skillet, swirling to cover the sides as well, and then add the apple and brown sugar. Saute the apple for 5-6 minutes to soften. Pour the mixed batter into the pan, and then transfer the whole skillet into the oven. Bake for 15-20 minutes until puffed and golden brown. Serve immediately with desired toppings. While the pancake is baking, you have the option of making an apple topping. Peel and dice the apple. Add to a saucepan along with the butter, sugar, lemon juice, and cinnamon. Saute for 8-10 minutes until the apple is soft. Serve over the top of the pancake. You can also sift powdered sugar over the pancake and drizzle it with caramel syrup. The pancake will start to deflate once it comes out of the oven, and that's completely normal. Depending on appetite, the one large pancake can serve 4 people, or 2 very hungry adults.